Chairman Wenstrup, Ranking Member Takano and Distinguished Members of the Subcommittee, on behalf of the Iraq and Afghanistan Veterans of America (IAVA) and our more than 425,000 members and supporters, we would like to extend our gratitude for the opportunity to share our views of VA’s VetSuccess on Campus (VSOC) program. I served in the U.S. Army from 2000-2003. I was deployed with the First Brigade Combat Team in October 2001 to Kuwait and Afghanistan as a Signal Support Systems Specialist. Upon my return, the proper procedures were not in place to catch what I was dealing with. At 19-years-old, I came home and was afraid of the dark; couldn’t sleep; and had a hard time eating. If the task was not mission critical, I could not find the motivation within myself to complete the task. Two months after I returned home, I caused an accident, almost killing myself and a friend. I was charged with driving under the influence. Everyone, including myself, thought I just had a problem with alcohol. But then I tested positive for marijuana. The Army left me no choice; I was discharged with a General under Honorable Conditions. During this same time period, my mother was diagnosed with stage four cancer of the throat and lungs. She was given six months to live and made it to December 2003. Six months after my discharge, I was homeless. A year prior I was part of the world’s greatest machine, the United States Army. But by December 2003, I found myself walking into a homeless shelter, unable to feed or house myself. I could not comprehend how this had happened. Shortly thereafter, I was granted a couch in a friend’s basement. I wish I had straightened my life out then, but this would not be my last experience with homelessness. In September 2004 I enrolled in college for the first time. My discharge left me without the GI Bill, so I took out Stafford Loans like the rest of the civilian population. I attempted college two more times following this 2004 attempt. I failed out in the first semester each time. Juggling work, relationships, family, and an addiction is not conducive to a learning experience. I would repeat the homeless cycle and enroll in college two more times, in 2008 and 2010. By 2011 I finally found permanent sobriety. After four years of documented VA therapy, and appeal after appeal, I was granted a service connected disability in October 2012. With school constantly on my mind, I immediately applied for the Vocational Rehabilitation/VetSuccess Program, was interviewed, approved, and enrolled in another college, after paying the back balances on my student loans. Jennifer Singer was the VA social worker who interviewed me for VA Vocational Rehabilitation and was then assigned to my case. The interview was tough. She asked some very personal questions. She also asked me what it is I wanted to do. I told her as a chronically homeless veteran with mental health and substance abuse issues, I wanted to make a living as a social worker. I wanted to help other veterans like myself. She said that was an admirable goal, but with my background, my life’s baggage, and my new family, being on the front lines wouldn’t be the best choice for me. I vehemently disagreed, but she challenged me and asked me to look at the salaries of social workers across the country. I found that a social worker makes $40,000 per year on average. She asked me if I could raise a new family, give them the opportunities I was never granted, and still live comfortably on $40,000. We agreed probably not. Ms. Singer told me she was investing in me. She was going to spend around $100,000 on my education, with her time invested, my education cost, and supply cost. She stated it was not a great investment for her to throw that kind of money towards an education that would only burn out two years after employment. And she was correct. I asked her how could I make a difference then. She told me I could make a difference from the flank. We all don’t need to be on the front lines to make an impact. Ms. Singer understood my background. I come from a single parent household. My parents did not attend college. My father barely graduated high school. My mother, my primary caregiver, never made over $30,000 in her lifetime. In a place without mass transit, we did not own a vehicle until I was 15-years-old. Because of the VetSuccess program, my children, both under the age of two, will understand the importance of an education. Not because I say so, but because I did so. I am currently an Organizational Communications major at Doane College in Grand Island, Nebraska. And at the community college I attended, I was part of the Honors Society. We all know the statistics of children whose parents did not attend or graduate from college. The challenges they face multiply immensely. Because of VetSuccess, not only will the barriers to my success be broken down, but so will my children’s. And they have not even enrolled in a learning system yet. Ms. Singer was also concerned about my mental health, my sobriety, and my living situation. Her job was not just to make sure I attended and passed classes. We made an agreement. She would hold me accountable, and I would give all of my effort during my vocational rehabilitation assignment. Since late January of 2013, I have accumulated over 60 credits, transferred from a community college to a four-year school, and have kept a 3.75 cumulative GPA. After I complete my Bachelor Program, I will move on to a Master’s Degree in Management with an emphasis in Leadership. Few chronically homeless individuals in this country receive Master’s Degrees. Fewer get Doctoral Degrees, but that is where I am headed. Without VetSuccess, this would NOT have been possible. My VA social worker, Jennifer Singer, is a guardian angel. Ms. Singer and I check in with one another each month. I am accountable to my VA Mental Health and Physical Health appointments. I report to her monthly on my sobriety, coping skills (both positive and negative), my current employment situation, and my family situation. Ms. Singer holds me responsible; as a student, as an employee, as a sober member of society, as a father, and as a husband. She keeps the goals that I set on the forefront of my mind. Is it hard work? Hell yes it is. But someone invested in me, so I owe effort and results. She reminds me I am an example to other veterans in my community. Believe me, other veterans are watching. I can offer them something no one else in the community can: PROOF. Proof the VA works. Proof accountability is positive. Proof we can turn lives around if we are willing to work with someone for it. I cannot say it enough, without Jennifer Singer, and the VetSuccess program, my family and I would not be where we are today. As a Nebraska Veteran Team Leader, Mr. Kaufman travels all over rural Nebraska to connect veterans with needed resources and one another. 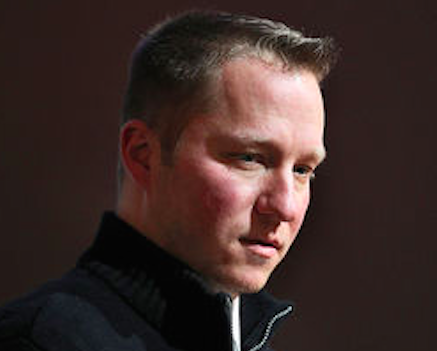 He also coordinates events, VetTogethers and peer support programs. He is currently a Junior at Doane College in Grand Island, NE majoring in Organizational Communications. Mr. Kaufman is a former Army Specialist who was deployed in 2001 to Afghanistan in support of Operation Enduring Freedom. 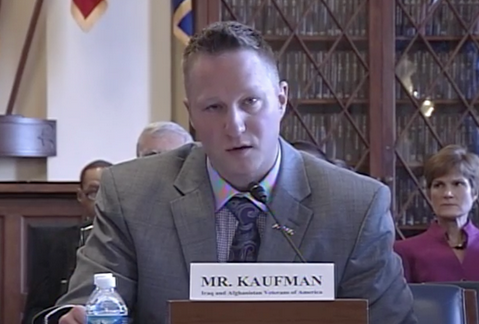 Neither Mr. Kaufman, nor the organization he represents, Iraq and Afghanistan Veterans of America, has received federal grants or contract funds relevant to the subject matter of this testimony during the current or past two fiscal years.